There really WAS a man called Bill Miner. Born in 1842 in Bowling Green, Kentucky, he lived a life of unusual, and mostly unorthodox action - for which reasons we claim him as our own, and cherish the story of a spirited rogue. More than anything else, Billy was a train robber. His actions were not always successful, but they were universally non-violent. And because the lawmen were as persistent then as they are today, he paid for his crimes by serving 36 of his 71 years in prison. From five of them he escaped. 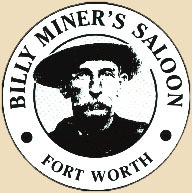 The Miner name popped up in New Mexico, Georgia, British Columbia, Colorado, Illinois, Michigan, Oregon, Washington - invariably linked with trains, stage coaches, and always, Pinkerton men. Miner died September 2, 1913 in Milledgeville, Georgia. In jail. We toast the memory of Billy, a genuine folk hero.